6-year-old Lauren amazed the judges by creating a website showcasing her summer learning, which included making a dinosaur model, studying ancient civilisations and even designing a space station! Lauren was inspired after using Discovery Education Espresso’s digital learning service at home during the summer break. The award-winning multimedia resources were offered freely to parents during the holidays as part of the Make Your World Bigger campaign. 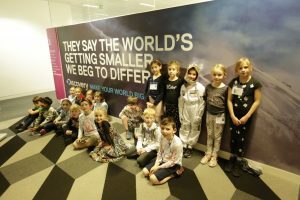 Accepting her prize on Friday, Lauren and her classmates took an exclusive tour of London’s Discovery HQ – home to shows such as Running Wild with Bear Grylls, Gold Rush, Wheeler Dealers and Marooned with Ed Stafford. Stepping inside the exciting world of broadcasting, the children put their film-making skills to the test by writing, filming and editing their own promotional video. They also enjoyed visiting the Discovery Channel media centre and meeting with real-life programme makers. With over 23,000 award-winning resources including interactive games, ebooks and short videos, Discovery Education Espresso has something to spark interest in every child. From exploring the limits of outer space to diving to the depths of the Atlantic Ocean, there’s plenty to keep young learners engaged — and to inspire them to continue to discover and learn new things. Schools interested in a free trial of the Discovery Education Espresso service can request one here.